The skin of the lower eyelids is thinner than the skin on the rest of our bodies. It tends to lose moisture more easily, and the blood vessels beneath it are more visible. These qualities, in addition to vitamin deficiencies, stress, aging, lack of sleep, over-exposure to sun or electronics screens, allergies, or illness, are the culprits behind dark circles. Most commercial dark circle creams are expensive and ineffective. Why waste time and money on those when you can reduce dark circles using a safe, natural, affordable DIY home remedies? Does Almond Oil Reduce Dark Circles? Almond oil is naturally anti-inflammatory, so it reduces puffy bags under the eyes and dark circles. It’s a good source of vitamin K, which improves clotting, reducing discoloration under the eyes. It contains palmatic acid and retinol, which moisturize delicate under-eye skin, leaving it soft and smooth. Almond oil contains anti-oxidants that keep skin healthy. It also helps contract dilated blood vessels that cause discoloration. It provides the monounsaturated fats and vitamin E your skin needs to remain youthful, supple, and radiant. As a natural emollient, almond oil balances the skin’s water content, preventing dryness. It helps to lighten the dark spots and removes the dark veins appearance to clear dark circles. Now you know why almond oil works. Below, you’ll discover several methods for using it to treat dark circles. Try them all until you find the one that works best for you. Massage improves circulation, reducing the dark appearance of the veins beneath under-eye skin. Wash your face with a mild cleanser and pat dry with soft towel. Apply a few drops of almond oil around the eyes night time before going to bed. Massage gently in circular motion for few minutes. Rinse with cool water in the morning. Eat 10 almonds daily along with application. Apply regularly to reduce dark circles. Rinse with lukewarm water in the morning. Avocado contains essential fatty acids and vitamins B,E, and K, which moisturize the skin and promote proper circulation. In a blender, mix 3 slices of avocado with 5-7 drops almond oil until smooth. Leave on 15-20 minutes, or until dry. Repeat regularly to get rid of dark circles. Night jasmine is a natural astringent and it reduces the inflammation that causes puffy under-eye bags. It cures dark circles formed due to stress or lack of sleep or due to any other health problems. Mix 2 tablespoons of almond oil with 2 drops of jasmine oil. Massage around eyes for 2 minutes to stimulate circulation. Mix equal quantities of almond oil and powdered milk to make a paste. Apply on the dark circles. Make sure it does not go into eyes. Note: You can also use regular milk instead of powdered milk and leave it on 10 minutes. Note: You can also crush or grind 5 almonds to make a powder and add few drops of milk to make a paste, and leave it on 10 minutes. Chamomile is anti-inflammatory, and it calms and relaxes to prevent dark circles. Wash your face with a mild cleanser and pat dry. Mix 1 tablespoon of almond oil with 2 drops of chamomile oil. Massage around eyes for 2 minutes before going to sleep. Repeat regularly to clear dark circles and puffy eyes. Lemon juice is a natural bleaching agent. Soak 10-15 almonds in water overnight. Peel them in the morning and grind or blend them to make a paste. Mix a few drops of fresh-squeezed lemon juice into the paste. Note: You can use rose water instead of lemon juice. Apply hot cloth pads under eyes and leave on 5 minutes. Apply cold cloth pads under eyes and leave on 5 minutes. Use fingers to massage almond oil around eyes for 2 minutes. Rose oil reduces stress and softens skin. Mix 5 drops of almond oil with 5 drops of rose oil. Use a cotton ball to apply under eyes. People have been using turmeric as an anti-aging treatment for centuries. It is naturally anti-inflammatory and it contains anti-oxidants that keep skin healthy. Mix enough almond oil and turmeric powder to make a paste. Repeat daily to cure dark circles. Mix equal quantities of almond oil and coconut oil. Apply and massage gently around eyes for 2 minutes at night time before going to sleep. Rinse with cool water in the morning and pat dry. Apply regularly to get rid of the problem. Mix 1 teaspoon of almond oil with a few drops of fresh-squeezed lemon juice. Massage around eyes for 2 minutes. Repeat daily for 15-20 days to get relief from the dark circles. Note: You can use almond paste (prepared by grinding the soaked almonds) instead of almond oil. Mix 1 teaspoon of almond oil with 4 drops of vitamin E oil. Castor oil contains essential fatty acids, and the ricinoleic acid in castor oil serves as an anti-inflammatory agent that reduces puffy under-eye bags. Wash your face with a mild cleanser. Mix equal quantities almond oil and castor oil. Leave on 40-60 minutes or overnight. Do not use other creams or lotions while using almond oil. Unless otherwise noted, repeat each method twice daily. Make sure not to get any of these mixtures in your eyes. Store almond oil in a cool, dark place to prevent it from going rancid. If you are pregnant, consult a doctor before using these treatments. Before using almond oil around your eyes, apply a small amount to other skin to determine whether you are allergic to it. Use organic, pure almond oil. These treatments usually take 2-3 weeks to produce noticeable results. Use sweet almond oil rather than bitter almond oil. If you are allergic to nuts, don’t use these treatments. If you see no results after 2 weeks, see a doctor to find out if your dark circles indicate an underlying health problem. Natural remedies require patience, but they are very effective over time. Have you tried any of these treatments for dark circles? Let us know which ones worked best for you! can we use hair almond oil on dark circles? No, please use sweet almond oil meant for skin application. I have had dark circles since I was in my twenties my question is Will this almond oil still work .me? Yes, it will work. Apart from that drink plenty of water to flush out toxins from the body, don’t scratch or rub your eyes and take 60 seconds break for 15 minutes while using computer. Where can I purchase almond oil? I’ve looked everywhere. If you are not able to find it in your local store try online stores like Amazon. Yes it is helpful only if you use it regularly. Hi. Why do you suggest NOT using any other creams with it? I feel like I would need more moisture than just almond oil. Almond oil is enough to provide appropriate moisture to the skin. Applying other creams make your skin greasy or chemicals present it can disturb the process of healing. Hi Garima, it is difficult to tell the exact time as everyone’s skin is different. Don’t lose hopeand repeat the application regularly. i also started using it today. If you are allergic to almonds then it is better to avoid it. Are Almond oils for dark circle around eyes and hair growth different? I have Almond oil for hair. Can I use it for dark circles around eyes for external use? You can use sweet almond oil for both skin and hair. But don’t use commercial ones which contain chemicals in them. No, use cold compressed sweet almond oil. I’ve had dark circles for 4/5 years now. I’m a 22 years old men with heavy dark circles around my eyes. can you suggest me some home and clinical remedies ? Almond oil contains vitamin E and K, mono-saturated fats and antioxidants which help to contract dilated blood vessels causing discoloration strengthen the skin cell production and balance water content in the skin cells. The natural bleaching agents of honey lighten the skin tone under the eyes. Here is the process of using almond oil and honey for dark circles. – Combine 1 tablespoon honey and 5 drops of almond oil. – Gently massage the mixture around the eyes. – Leave the application over night and rinse off with lukewarm water in the morning. Apart from following the remedy, don’t rub the skin under eyes and wash your face regularly. How many days will it take to remove my dark circles if I use regularly. It is hard to tell the exact time as it depends on the person’s skin type, sleeping pattern and other habits. So, try the remedy regularly with some patience until you achieve the results. However, you can see the improvement in 2 – 3 weeks. Whatever brand you choose, make sure it is cold compressed sweet almond oil. Hlo rubbing the dark circles with badam rogan tail would make the skin oily??? Almond oil doesn’t make the skin oily if applied in enough amounts. If you apply more than your skin requires it makes the skin oily and clogs the pores causing pimples. Can I apply Almond oil in skin? Or should I use sweet almond oil ? may I know the difference between almond oil & sweet almond oil? Thx. Sweet almond oil is extracted from sweet almonds. It contains a large amount of polyunsaturated linoleic acid, monosaturated oleic acid, vitamin E and B. Almond oil or bitter almond oil is extracted from bitter almonds. It contains some poisonous compounds as hydrogen cyanide, glycoside amygdalin and benzaldehyde. While both are used for medicinal purposes yet bitter almond oil can only be used under doctor’s supervision for specific problems. So it is very important to try sweet almond oil for treating dark circles under the eyes. Hey , thanks for helping people by this way , i have a question , i bought khadi sweet almonds oil . Is it good for dirk circle ???? Make out some time and reply thankyou. Yes, you can use it. And thanks for the appreciation. Hey. Thanks for such an informative article. Do we have to follow all the above remedies or just doing one of them regularly would suffice? I’m following the first one at present- massaging just the oil at night. You have to choose any one remedy and try it regularly. Yes, that is enough but make sure to repeat it regularly without fail. Yes, I’ll be doing it regularly. Hope this works. Will keep on updating about the progress. Ive been having dark circles since high school, now l’m 31 years old . I brought Beauty Aura sweet almond oil. Will this oil work for my dark circles? from where u got this badam oil. i alsostay in mumbai . I use shea butter for my face during the day. Can I still use shea and use the almond oil at night for my dark circles? It is better to apply only almond oil on the dark circles. Our skin has only certain capacity of absorbing creams or oils. Once the skin absorbs the shea butter, it cannot absorb the almond oil immediately and it becomes greasy. Restrict the shea butter application only to the day after before going to bed, wash your face, pat dry and apply almond oil. Hope this helps. The amount of almond oil for massaging dark circles depends on the skin texture of an individual. If you have oily skin then 3 – 4 drops should be fine. For dry skin, then you may need more than 5 drops. Choose the amount as per your skin texture. Plz tell me that for how many days we can store almond oil and vitamin E mixtur ? ?? You can store it for few weeks. I am 22 year old male I have excessive dark circles which I guess is heredity. Will sweet almond oil cure my dark circle? If yes, please suggest me a good brand. Yes, it will help. Choose any brand which sells 100% pure sweet almond oil. u can use Hamdard Roghan Badam Shirin Sweet Almond Oil. its easliy awailable at any general store or chemist shop. i m also using this. Can heredity dark circles be cured using this sweet almond oil? i have bought aroma magic under eye gel and hamdard rogan badaam shirin oil. I would like to know if i can use both simulataneously? It is better to use any one of the treatments. Try any of the treatment for few days, if it doesn’t work then try another. Can we use Dabur almond oil .will it work ??? You have to use pure sweet almond oil for best results. Almond oil that is chemically processed will not show any positive results. Can i mix sweet almond oil with honey/jasmine oil/turmeric or others and store it? Or i can only make them when i want to apply them? No, it is better to freshly prepare whenever you want to apply for effective results. Yes, you can. Remove the contents of a vitamin E capsule and gently rub it over the face concentrating more on the dark circles. Do this daily before going to bed. Once the dark circles go away do I still need to use the almond oil daily? You can apply twice or thrice in a week to prevent the dark circles. hey.. i have bought dabur badam tail.. please te me that this product is sweet almond oil or bitter almond oil.. and can i use this oil for dark circle.? Check the ingredients list to see if it is prepared with sweet or bitter almonds. Hi can I use patanjali Divya badam rogan almond oil and honey for reducing dark circles? If the brand states 100% pure sweet almond oil then you can try it. I am using rogan shirin almond oil 100% sweet almond oil. I am using this oil since 2 months and no results. It showed the result in the 2nd week but now my dark circles are become more darker. Please help me what to do? Apart from following the remedy, you have to get enough sleep, avoid applying any other creams under the eyes, if you are using almond oil and include vitamin E, D and C rich foods in your daily diet. Try the routine you have mentioned for a month and check the results. If you don’t see any improvement, then try a different method. Apart from trying out the methods, you have to get enough sleep and reduce stress levels. Can I mix jojoba n rose hip oil to the almond oil? I applied almond oil yesterday n went to bed ..i started feeling irritation in my eyes after 5 mins..n when i woke up in the morning i also felt some strain ..amd i was also very careful while apllying the oil..what’s the reason behind it ? Hello, this is very helpful information. Can I use the sweet almond oil mix with coconut oil after I get out of the bath or shower as well as treating my dark circles and wrinkles? Yes, you can apply the mixture after bathing. my dark circles have reduced a great bit. Could u also suggest a remedy for even toned fair glowing facial skin? I do not use any artificial product on my face except for nivea facewash. Can u use almond oil as a moisturizer under make up. Yes, you can but make sure you don’t apply excess as it can leave your skin greasy. Use only sweet almond oil for achieving results. I’ve been recommended Avocado oil aswell… Which one is better? On the package it says that Avocado oil helps to reduce signs of tiredness which is probably what dark circles are… but you recommend Almond oil…. which one should I use? As both avocado oil and almond oil are effective in treating dark circles, you can try any one as per your interest. I somewhere read that mixing coffee with almond oil gives better results?? Does it work? Should I apply the mixture? Yes, you can try coffee and almond oil combination. The caffeine and tannins present in coffee improve blood circulation and dilate blood vessels. Almond oil rejuvenates, hydrates and lighten the skin. Can I use almond oil by boutique ? Nope, use only sweet almond oil. Can I use bajaj almond hair oil ? If it is organic and sweet almond oil then you can use it. Is it ok to use a primer and concealer over the almond oil? Hlo….pzzz sugest which almond oil is good for dark circle, and from where I can get it????? 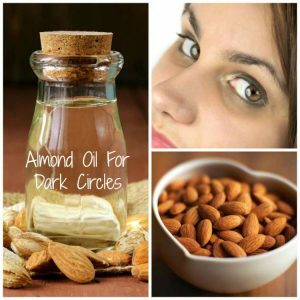 Sweet almond oil is good for treating dark circles. You can buy it at any local store or online stores like Amazon. Can i use the almond oil at night and my over the counter eye cream in the day? Hello! I have bells almond oil but I should buy sweet almond oil instead of using that one? If bells is not prepared by using sweet almond oil then you have to buy a new one. When using organic sweet almond oil and coffee grounds must the grounds also be organic? If you can get organic coffee grounds then it can be great. However, if you cannot get them then you used the normal ones as well. Hiii i m viky 27 year male..i m using roghan badam shirin sweet almond oil…will it work ?????? Yes, it may help. Try it and let us know your experience. Yes, you can use sweet almond oil as daily cream and go out in the sun. If you use in less amounts then it will not. If you use more than your skin can absorb then it will clog the pores. Hello I’m a 21 year old male. I have been using Hamdard Sweet Almond oil for the last 2 months, still I see​ no improvement. Should I consult a doctor to check whether it is hereditary? Yes, it is better to consult a dermatologist. Hello, what is the difference of sweet almond oil and regular almond oil in terms of the result? Sweet almond oil provides more effective results than regular almond oil. In some cases, chemicals used in the process of making regular almond oil can cause harm to the skin and worsen the problem. can i use sweet hair almond eye its not organic? Yes, you can. But make sure to patch before using it. i have a problem of dark circles due to using of spectacles..
what should i do to get rid of this problem… ? Before going to bed, apply almond oil or freshly extracted potato juice on the dark circles. Leave the application overnight and rinse off in the morning. sufficient for reducing the dark circles..?? If it is extracted from sweet almonds then you can use it to treat dark circles. Yes, you can. Just make sure it sweet almond oil while purchasing. Can I use Bajaj Almond oil??? I am using Bajaj Almond Oil and my dark circles are getting better. Oil must have vitamin K and E.
mixing of almond oil with vitamin e oil and leaving overnight. will it work? Can I apply and keep almond oil with vitamin e whole night? Can I use dabur almond oil for removing dark circles??? I have dark circles from 7 years.. Will almond oil helpful for me..
i have dark circles for more than 10 years. will sweet almond oil help me? Coconut oil can be used alone or in combination with other natural ingredients that keep skin healthy, firm, smooth, and bright. Try all the methods below until you find the one that works best for you.